Seeking to take advantage of the burgeoning 3D printing industry of India, global PC and printer giant, Hewlett Packard Inc. has announced that it will start selling 3D printers in India from the first quarter of 2018. Speaking about how the company aims to target the Indian 3D printing market, Sumeer Chandra, Managing Director, HP India said, “We are planning to launch, sell and service 3D printers in India mostly for the commercial segment”. Initially, the company aims to target the sectors where 3D printing is widely used – automobile and healthcare. Image: The HP Jet Fusion 3D 4210 Printer Image Credit: HP Inc. The company is planning to sell its 3D printers all over India and is also working in conjunction with global pharmaceutical giant, Johnson & Johnson to create 3D printed prosthetics or a dental implant. “Initially, HP will offer 3D plastic printers and we will introduce metal 3D printing whenever it is available,” Chandra added. 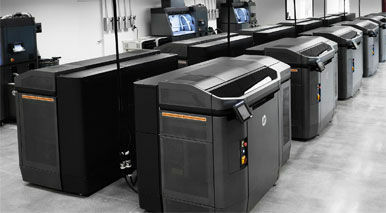 HP has revolutionised 3D printing with its Multijet Fusion 3D Solution and the company now plans to extend its reach by launching The Multijet Fusion 3D in India to 3D print objects that range from plastic parts, car panels, manufacturing prototypes and even body implants. The printers are already being sold in countries such as China, Australia and Japan at $100,000.